As we all know by now, GPS is used in everything from driving to school, to farming and aviation to public safety and disaster relief and recreation, not to mention its military purpose of providing precision navigation and timing to our combat forces. And we’ve often covered some facet of GPS – or GPS vulnerability. This column is about both. First and foremost, GPS is a military imperative. As such, as of February 2016, 72 Global Positioning System navigation satellites had been launched; not all remain operational. The minimum number of satellites for a full constellation is 24 operational 95% of the time; the current number exceeds this. The target number is 33 and decommissioned reserves are available to maintain the numbers. We as tax payers benefit from its enhancements but it has to work for our armed forces – land, sea and air. And as military requirements go up, so does therefore the capabilities of GPS. In fact, the current GPS system is unable to deliver what our armed forces need – so, starting several years ago, GPS-III was started to be put aloft. This naturally required an entire new ground control system. The Air Force took the next step in that process when it awarded a contract at the time to Raytheon Company for the Next Generation GPS Control Segment, now referred to as OCX. Despite the fact is that program is late and over-budget, the program is critically important because GPS 3 satellites’ stronger, more accurate and more jam resistant signal can’t be effectively used until the ground stations are up and running. Starting over would have put the country years behind. This modernization doesn't leave the “old” GPS satellites flying “blind.” OCX will maintain compatibility with the current satellite constellation and enable new modernized signal capabilities. Win, win, win. The Achilles heel of GPS is the extremely weak signals that reach the receiver. It has been estimated that each satellite in a sat-nav constellation is putting out less power than a car headlight, illuminating more than a third of the Earth's surface at a distance of more than 12,400 miles aloft. This is what makes it possible, if not easy, to jam GPS signals. In fact, our military does it to suppress enemy abilities in this area, as they try to do to us. 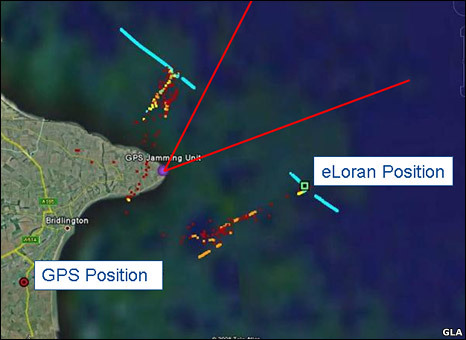 Of a more serious nature, GPS receivers can be "spoofed" - not simply blinded by a strong, noisy signal, but fooled into thinking their location or the time is different because of fraudulent broadcast GPS signals. Someone with mal-intent can now buy a simulator, link it to Google Earth, put on a route and it will simulate that route to the GPS. A GPS receiver overcome by it will behave as if you're travelling along that route. Admittedly, this isn’t easy but terrorists are determined agents. The immediate solution to the problem is not clear, since the existing US GPS, Russian Glonas systems, and European sat-nav effort Galileo, are equally susceptible. What to do about it? We can leave the longer term solution to the government but, for us, recall what I have often said – if your eyes say “danger ahead” but the GPS says “drive on”, trust your eyes!